It seems diamonds aren't just forever (or a girl's best friend) - now they're the foundation of a potentially super-strong wonder material. One that's based upon microscopic nanothreads that could even give graphene a run for its money. 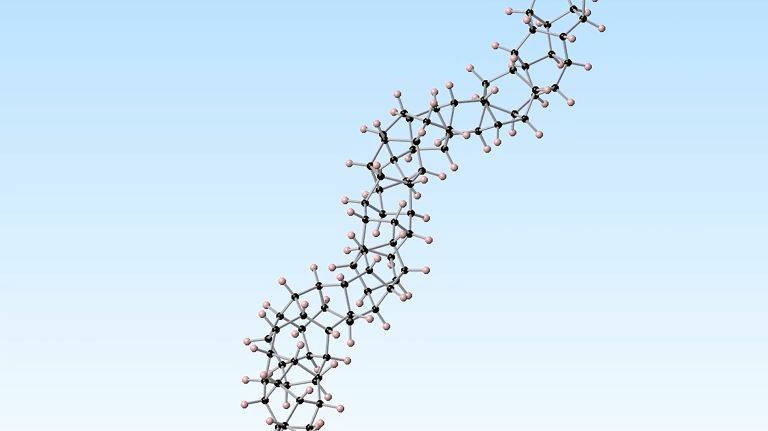 The research, which originates from a study presented by the University of Queensland in Australia, says these these diamond nanothreads (which are actually one-dimensional diamond crystals capped with hydrogen) could provide a flexible yet stable structure. The study suggest this could be done by artificially adding molecular defects to the benzene ring of a diamond nanothread. Yes, could. Turns out the team have only been able to test their theory using a software simulation - however, a team at Penn State University did manage to create a sample of this ductile substance but it's a complicated process and there's no clue yet whether it could be replicated on a mass scale. Of course, while the material is still very much in its early days, it's already been raised as a potential material for the long-theorised space elevator that would create a physical link between the Earth and space.